The SF1 is one of my favorite classics: Laverda’s answer to the sportbike question posed by bikes like Guzzi’s V7 Sport, Ducati’s 750GT, and Norton’s Commando. The Italian manufacturers of the period seem to have been drawn to v-twins, but Laverda’s parallel-twin configuration offered compact packaging, elegant looks, and famous durability. 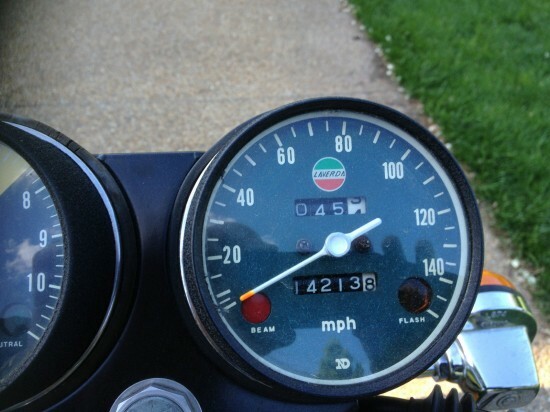 Interestingly, Laverdas in general have a reputation for bucking the stereotype that European machines are unreliable and temperamental. They may have been expensive, but they were built using the best available components: if a part was made in-house, it was made to a very high standard, and parts from outside manufacturers were chosen based on quality and performance, including Bosch ignition components and a Nippon-Denso starter for reliability. 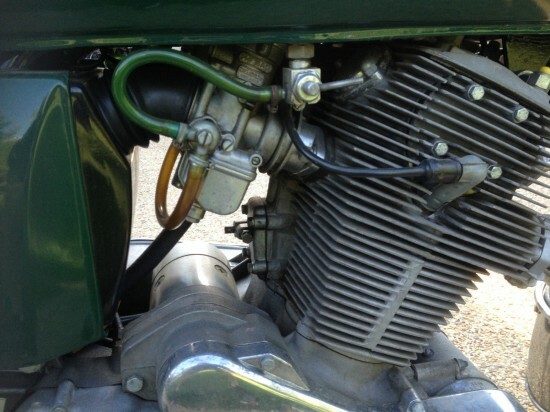 Laverda’s overbuilt twin may have been on the heavy side, but was famed for its stability and reliability and racing versions did very well in endurance events. 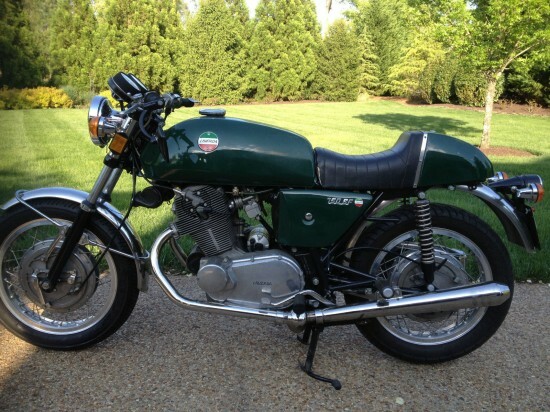 Early bikes like this one featured Laverda’s huge 9” drum front brake that was very powerful for the time and led to the bike’s name: “SF” stands for “Super Freni” or “Super Braking”. 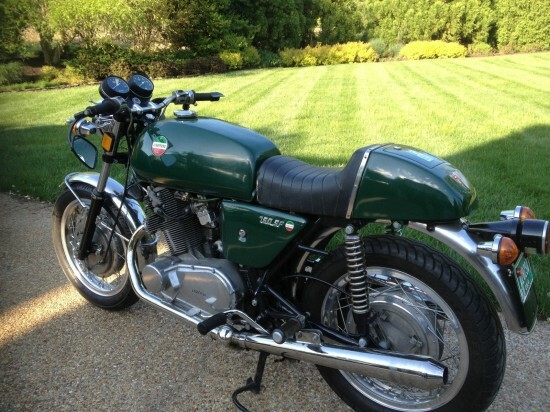 Very nice Laverda SF1. Has been sitting in a museum, but ridden three years ago. Ran well when parked. 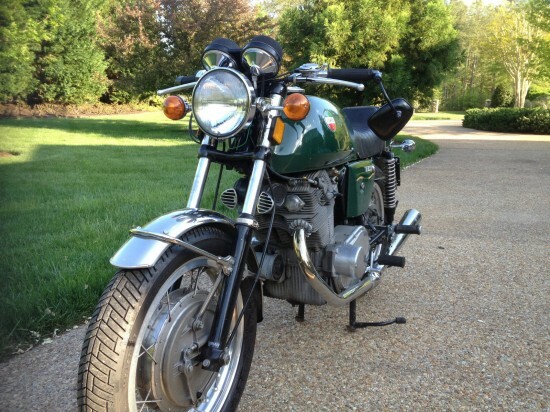 Will need a new battery and maybe the carbs cleaned. This motorcycle is in nice shape except for the seat. At least we know the seller is an Italiophile: if you are sharp-eyed, you might notice what looks like a grey and black Laverda Jota in the background has been featured before on this site, along with what appear to be the back ends of a Fiat Spider and a Lancia Scorpion there as well. Hopefully that’s some indication that the owner knows what he’s doing when it comes to older Latin machinery. These bikes have a different sound than v-twin Moto Guzzi or Ducati of the period, but are unmistakably distinct from parallel twins from the UK. For collectors, the earlier, drum-braked models are very desirable. Obviously, the move to double front disc brakes on later SF’s was a welcome step forward in terms of performance, but the huge drum on the front of earlier bikes represented the pinnacle of the drum-braking technology and does provide plenty of stopping power when properly set up. 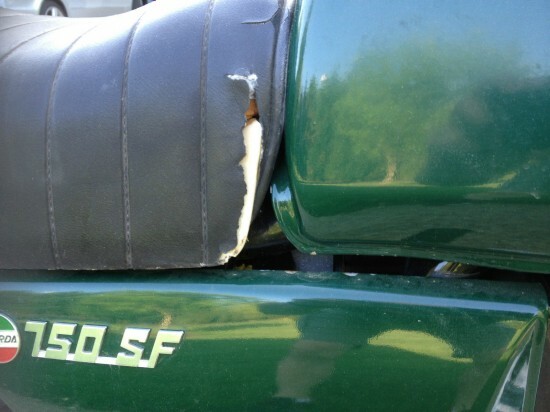 The $8,500 asking price is on the high side for an SF, but not outrageous: the bike appears to be in excellent shape, barring the easily repaired tears in the seat and the fact that it isn’t orange. 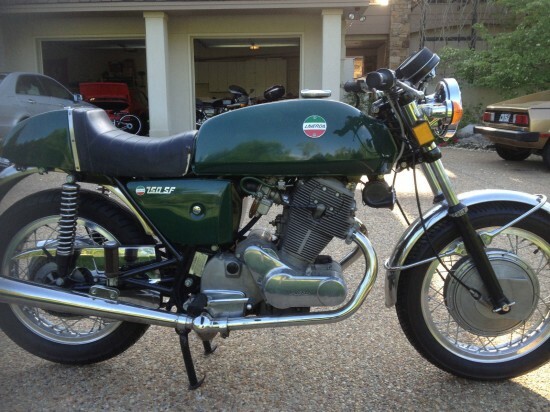 Back when I was bike shopping, Laverdas like this ran about $5,000 when you could find them, and I often wish I’d waited for one to show up before I plunked down my cash. Sold in about 3 hours . . .